So how long until the folks with the Pac-Man license demolish this? 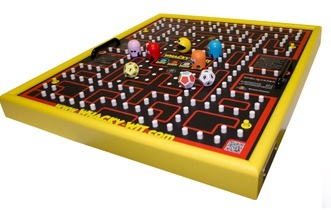 It looks cool, moreso than the old Pac-Man board game, but if they will potentially get sued it seems a bit risky to invest in them. Hard to say if it'll happen. Midway games imploded and they've been selling them in Germany for almost a year unimpeded. I do not know the particulars of EU Copyright law here, so I can't offer professional commentary. As a lover of board games, I have to thank you for my newest Youtube subscription. That was pretty fun to watch. There was a game made by pacman that kind of looks similar to this one. Think guru larry and ashen made a video on that one. this video. Couldn't embed it. Well it would be namco who would be interested since it is their ip, midway just had the north American distribution license for arcade machines. Hopefully they see it and pick it up.